Note: Based on a comparison of Army pay rates, one pound (£1) sterling in 1900 is equal to approximately $(AU)1,000 in 2011. Animals were an important part of the logistics for the Boer War, drawn from across the British Empire as well as Europe and the Americas. 360,000 horses out of a total of 519,000, had to be shipped into South Africa. 106,000 mules and donkeys out of a total of 151,000 were also brought into the region for the war. The number of horses killed in the war was at the time unprecedented in modern warfare. For example, in the Relief of Kimberley, French's cavalry rode 500 horses to their deaths in a single day. The wastage was particularly heavy among British forces for several reasons: overloading of horses with unnecessary equipment and saddlery, failure to rest and acclimatise horses after long sea voyages and, later in the war, poor management by inexperienced mounted troops and distant control by unsympathetic staff. 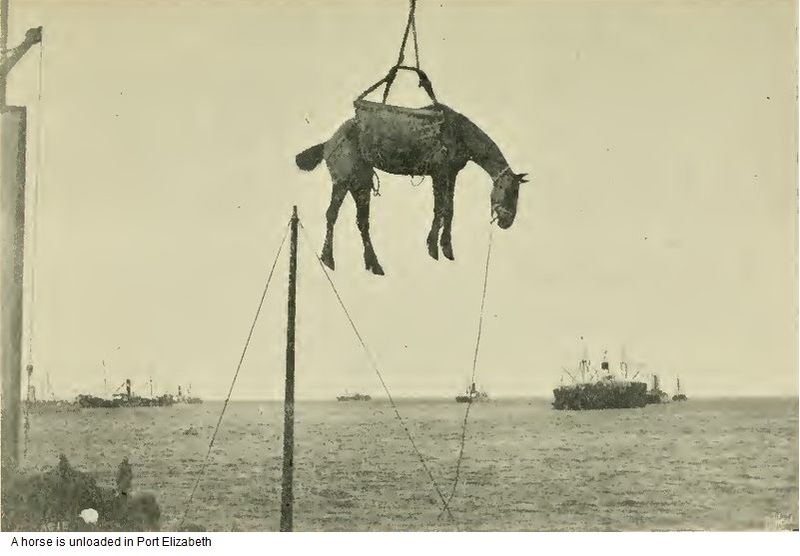 The average life expectancy of a British horse, from the time of its arrival in Port Elizabeth, was around six weeks. Horses were on occasion slaughtered for their meat. During the Siege of Kimberley and Siege of Ladysmith, horses were consumed as food once the regular sources of meat were depleted. The besieged British forces in Ladysmith also produced chevril, a Bovril-like paste, by boiling down the horse meat to a jelly paste and serving it like beef tea. One of the most interesting studies in the Boer War was to see how the various breeds of horses stood the work they had to do. The army were mounted on animals drawn from all ends of the earth; great round-hipped English chargers, light wiry Australians, mongrel Argentines, wonderful little Burmese ponies and last, but not least, the Cape horses. A military writer has committed himself to the opinion that the Cape horse is useless for military purposes, nevertheless it was on Cape horses that the Boers did all their work, and the rapidity of their movements showed that they were not mounted on useless horses. The questions to consider are: What sort of horse is the best for war? How did our Australian horses compare with those from other countries? Are the Australians breeding the right type of horse? Considering that the Empire spent at least £100,000 on horseflesh in Australia during the war it is well worth the while of Australians to see that they are breeding the right sort of animal to supply this large demand, as no such chance of turning our horses into money is likely to occur in any other way; theIndian market is a steady market; but for wholesale transactions the Army is likely to be our best customer, and it is worth our while to try and produce such animals as the army is likely to need. And that introduces the first question, namely, what sort of horses are required? Army horses may be divided into three classes - cavalry horses, mounted infantry horses, and gun horses. The cavalry horse is the hardest sort to get. The cavalry saddle with full equipment weighs about 45 kilos, so that a fairly heavy man, say 75 kilos in weight, rides his horse at the cruel weight of 120 kg. With this weight on their backs, the cavalry horses are supposed to be able to move from place to place at the rate of fifteen kilometres an hour; they are expected to have breeding and pluck enough to be able at the end of a long day to charge a retreating enemy and cut him to pieces. They must be prepared to do scouting work, riding round hills all day, varied by hurried retreats at full gallop under fire. A first-class Australian steeplechase horse would make an ideal cavalry horse; but needless to say there is no hope for profitably breeding horses of that type at such prices the Army offer - very few people can breed them at all, and when a horse of weight-carrying power, pace and quality is produced he is worth more as a carriage horse, or as a gentleman's hackney, or a hunter, than as food for powder. 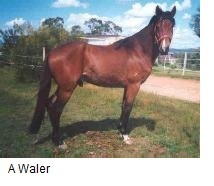 If any breeder can breed a number of big well bred handsome horses, fast and active and up to 115 kilos, he has no need to wait for the army to buy them - he can get buyers for all he can breed. The Army only gave £16 on an average for the horses of cavalry type in Australia, while the English cavalry horse cost £40 per head; consequently, it is next to impossible to draw any fair comparison between the English and Australian cavalry horses as their prices were so widely different. It would be manifestly unfair to expect a lot of £16 animals to do as good work as a lot of horses that cost two and a half times that much; but some grounds of comparison exist as a matter of fact. The two cavalry squadrons that went from Australia were, by the liberality of the Governments, mounted on animals for the most part, far and away above the £16 standard. The New South Wales Lancers were supplied with police horses, many of which were worth quite £40 a head in Australia; in fact, if Australia had been raked from end to end, no better lot of horses would have been assembled together than those taken by the New South Wales Lancers. They were all well bred, well finished horses up to any reasonable weight, and many of them were fit to run a steeplechase in any company. Beside the English cavalry horse, they looked light and weedy; their loins were lighter, and their quarters were drooping, and in the eyes of the English authorities they were all too light framed to command admiration. There exists an enormous difference between the English and the average Australian horse on the point of solidity; their horses look lumbering and underbred to us, while ours look weedy and weak to them. On the point of actual weight-carrying qualities, the English horse must be given the palm. They are so strong and sturdy that the 110 to 115 kilos of weight on their backs does not materially distress them; while our lighter framed horses felt the weight very much. English and Australian Chargers contrasted. It may be a shock to Australian vanity to learn it, but the war showed beyond any question that we do not breed the type of weight-carrying charger equal to the English. This was well exemplified in the great difficulty and time occupied in getting two chargers to send as presents from the people of New South Wales to General Baden-Powell. The two animals sent - costing over £100 each - were very excellent type of the good-class "waler", but as officer's chargers they simply were not to be compared to the chargers ridden by the English cavalry officers. Every English cavalry regiment at the front could produce five or six officer's chargers, handsomer, stronger and more up to the work than those sent from Australia to Baden-Powell; and the same thing was true of the rank and file of the troop horses. Our horses certainly had more "quality", and were more galloping and thoroughbred in appearance, and no one with experience can doubt that a well-bred weed is better than a big mongrel. But the English horses are not by any means mongrels. They were, many of them, as well bred as our own. In fact all our well-bred horses are descendants of English horses. Many of the officers were riding their own hunters as chargers, and among these hunters were some splendid animals. Enquiry failed to elicit exactly how they were bred - "by a thoroughbred horse from an Irish hunting mare" was the usual reply, an unless we know how the "Irish hunter mare" is produced the answer does not throw much light on the subject. These Irish mares are apparently nearly thoroughbred, and the marvel is, how the Irish breeders can keep up such a standard of strength and size without getting in the fiddle heads, the huge feet, and the hairy fetlocks of some more heavy breeds of horse. However, it is done and the fact remains that English horses of the best class are finer animals in appearance than the Australian horses; they carry weight better; and for standing privations and misery they seem no way inferior. The fact is, that all well-bred horses were too delicate to stand starvation, sickness and mismanagement. They became sick, refused their food, and of course soon died. The English horses fared no better than ours, and indeed, it would have taken a lot of iron horses to stand the vicious mishandling to which the poor unfortunate four footed servants of the Army were subjected. Good horse, or bad horse, right type, or wrong type, the ill-treatment and hardships they had to undergo brought them all to one level and the "£5 scrubber" was quite as likely to survive as the finest specimen of the weight carrying charger. It was not the severity of the work they had to do which killed them; but it was the wretched conditions under which they did their work. If our horses could have been kept free from sickness, and have been properly fed, they could have done all the Army work with the greatest of ease. As it was, they died like flies. The question of the Australian as a cavalry horse may be summed up by saying that the best Australians are equal to the best cavalry horses in the world; but horses of the cavalry type are not bred in sufficient numbers to induce the Army to send out here for them. Those that are bred command such high prices that the Army cannot afford to buy them as "food for powder". Australian breeders must not think that, because second-rate horses sold well during the war as cavalry horses, the Army will buy second rates in peace times. They will then only take really first-class horses for cavalry work. The question therefore, presents itself; why do not our breeders set to work and breed large numbers of these good horses? Alas, it is easy enough to talk about it, but to do it is another matter. There are hundreds of experienced men with capital and brains trying year after year to do it; there is a certain fortune for any man that can do it, and yet it is doubtful if any single breeder of good-class horse flesh can honestly feel sure of breeding a cavalry horse; and for one that is bred there are so many failures that the business fails to pay. It is doubtful if any breeder of any kind of horse ever made much money out of the business, and as for breeding cavalry horses in Australia there are two objections to overcome, viz, (1) It is very difficult to do, and (2) It does not pay. The horse for Mounted Infantry work does not require anything like the type of animal used for Cavalry. The Mounted Infantry man gets off his horse to fight, while the Cavalry man is supposed to fight on his horse, and the activity, speed, courage and docility of the animal are of the highest importance, but the Mounted Infantryman only used his horse as a means of locomotion, so a much less pretentious animal serves all useful purposes. The Mounted Infantry horse is one that has just missed being a Cavalry horse; perhaps he is a trifle too plain looking, or a trifle too under-bred, or a trifle too hard to steer to do for the exaction's of Cavalry work; but if he has four sound legs and a body, and a head, he will do to carry Mounted Infantry. The Mounted Infantry horse at the war comprises every class of animal, from the very best down to the very worst; they were starved and ill-treated in the same way as the other, and, therefore, as a mere matter of survivorship, the Australians are not likely to have done very much better or very much worse than other horses. But their work was first-class, and for good useful wear-and-tear horses, Australia has nothing to fear from the competition for any other country so long as our horses are kept up to a fair standard. Those used by the Army were obtained in thousands at a cheap rate, about £12 per head on an average. Their only competitors in cheapness were the Argentines, who cost £8 a head. Thousands of these Argentines were sent over, and they were an interesting study to the student of horseflesh. They were squat, short-legged cobs, with big hips and bad shoulders, very arched necks, and heads like the paintings of the horse Bucephalus, ridden by Alexander the Great. Probably they were bred from Bucephalus, as one fails to guess by which intermixture of strains of blood the type was arrived at. It is certainly a fixed type now, as of the thousands sent over at least ninety per cent resembled each other so closely that is one lost an Argentine pony, there was very little chance of identifying him among his comrades. They were worthless, cow-hearted brutes, and no one that used them ever had a good word to say for them. 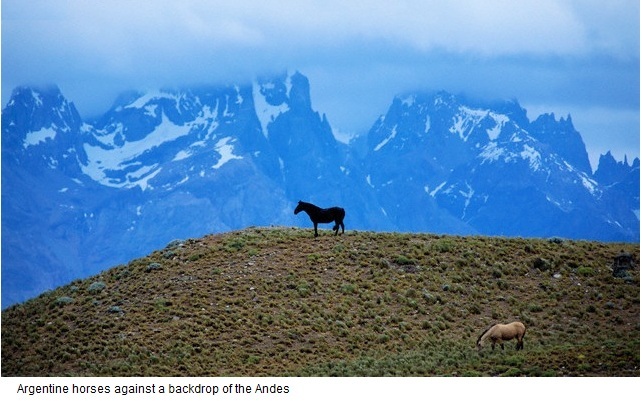 They may have good horses in Argentina, but none of them found their way to the war. The Australians, on the contrary, were light and wiry, and active, and there was no comparison between the two types of animals. Judging from theBoer War, the Mounted Infantry arm of the service will be much extended, and our breeders can look forward to a steady demand for "useful" horses. Of course, £12 is not a very high price; but there are thousands of small breeders who have each year a few surplus animals to sell, and at £12 a head they should pay well enough. The breeders must remember that weight-carrying power is the great essential, and a sturdy type of cob about fifteen hands high is the ideal Mounted Infantry horse in the eyes of the Army. There are two classes of Gun Horses required for the Army; the Field Battery Horses and those for the Royal Horse Artillery. The former are heavier than the latter, and our "active draught" animals fill the requirements very well. English Officers buying horses are more active, and have to be able to go at great pace, and carry a man and drag a gun at the same time. 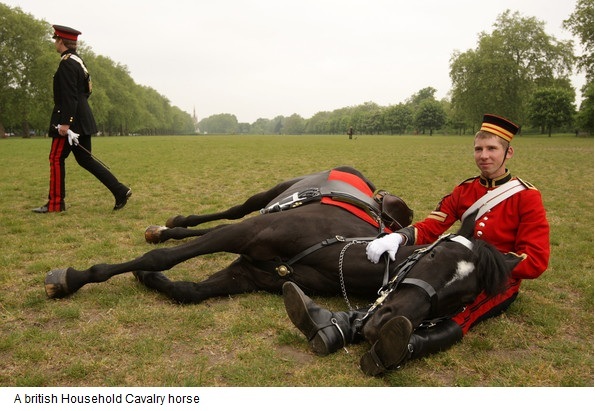 A first-class carriage horse is the type for the Royal Horse Artillery; but needless to say, animals of this type are hard to get in Australia at Army prices. Breeders can sell all the carriage horses they can produce without having to wait for the Army to buy them. In connection with the purchase of Australian horses for England, the greater number were bought in New South Wales; but this was not due to the superiority of the New South Wales animals, but because the English Officers made Sydney their headquarters when they first started buying. Adelaide was spoken of as the best place for a centre of observations, but they came to Sydney, it is said, at the representation of a New South Wales gentleman, who met them on the mail steamer, and who thus put some thousands of pounds into the pockets of the horse breeders of his native colony. But very few animals of the true Royal Horse Artillery type were forthcoming, and a very good judge of horseflesh, writing from the front, on the question of trying to secure a few mares of that type for his friends in Australia, said: "Truly, the sight of the solid, well-shaped English horses was a lesson to many who went off to war full of the idea that the Australian horses were the best in the world." Besides the English, Australian and Argentine horses, there were representatives of the equine race from every part of the world. The most marvellous arrivals at the front were the little ponies ridden by the Burmese Mounted Infantry. Imagine an animal thirteen hands high carrying a man and his gear, weighing 110 kilos, from daylight till dark, day after day, on a diet of a few handfuls of mealies, and that is what the Burmese ponies did. They were so small that if they fell into an ant-bear hole they disappeared altogether, rider and all; and yet they would usually come into camp pulling hard at the end of the day. They were not very sturdily-built ponies either - only just about the style of a Timor pony, but their strength and endurance was marvellous. The Canadians bought some very fine horses - well-furnished, strong animals, up to any weight. The New Zealand horses were an excellent lot. The Cape horses were an object lesson to our breeders had any breeders been their to profit by it. At one time the Cape was the great breeding ground for Indian remounts. Almost all horses for the Army in India were got at the Cape, but the Cape people made the very mistake which the Australians are now making; they did not feed the mares and young stock sufficiently, and before long the horses at the Cape had run down in size so much that now-a-days a Cape horse, with any substance is a rarity indeed. Our breeders are doing the same thing. All over Australia horses are allowed to live as they can on the natural grasses, and the result is that in the bad seasons the mares are unable to rear strong foals; and these again when they grow up, rear weaker animals still. The Cape ponies - for they are not worth the name of horses now - are small, weedy, narrow little things, but they are full of "quality". Being in their own country, they did not get sick, and they stood more work than any other style of horse, but the great weights they had to carry soon brought them to grief. The Basuto ponies were more solid. The story is told that an old Scotchman took a herd of Shetland ponies to Basutoland, and crossed them with Arabs and well-bred horses till the present Basuto pony was evolved. However he is bred, there is no doubt the Basuto is a wonder, and the only trouble was that the natives would not part with them. Hardships that brought all other horses to grief were as nothing to the "genuine" Basuto; and, indeed, the hardships were pitiable. Husbandry was not a strong point during the Boer War, horses endured extreme hardship and died in unprecedented numbers. 60% of the horses died in combat or as the result of mis-treatment as opposed to 3% of human combatants. The distances were great, and Boer forces did not just move along railway lines. 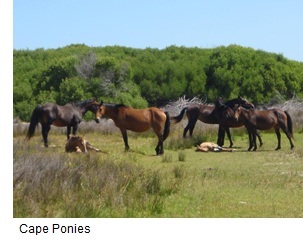 The Cape Ponies of the Boers were used to the rough grass of the Karoo; the horses from overseas were not. Cavalrymen trained in lush climates were used to their horses gaining much of their sustenance form available local forage, that was not the case in South Africa. Australian soldiers, good horsemen, were used to being able to rest horses as on the farm at home, there were always fresh ones. In South Africa there was no such luxury. The well trained British cavalrymen, and the New South Welshmen, trained at Aldershot, knew the requirements to rest and look after their mounts, the movement required and a lack of understanding by Army staff, however, meant that few of the husbandry requirements were able to be met. Thus we have the example of the 500 horses ridden to death in the relief of Kimberley, and the overall 60% attrition rate. It is interesting to note how history can repeat. Australian forces in Afghanistan are where possible moved using Bushmaster light armoured vehicles. Initially seen as being a kin to the vehicles we use for every day transport, they were initially crewed by soldiers of any corps having been given a short driving course. It was found that the vehicles did not perform well, they were found to be prone to breakdown. Our Australian Tank Regiment, 1st Armoured Regiment is currently (2011) not deployed in combat, but has the very vehicle crews imbued with vehicle husbandry; a discipline that ensures vehicles are maintained and ready for deployment at any time. Bushmasters in Afghanistan were thereafter crewed by soldiers from 1 AR. 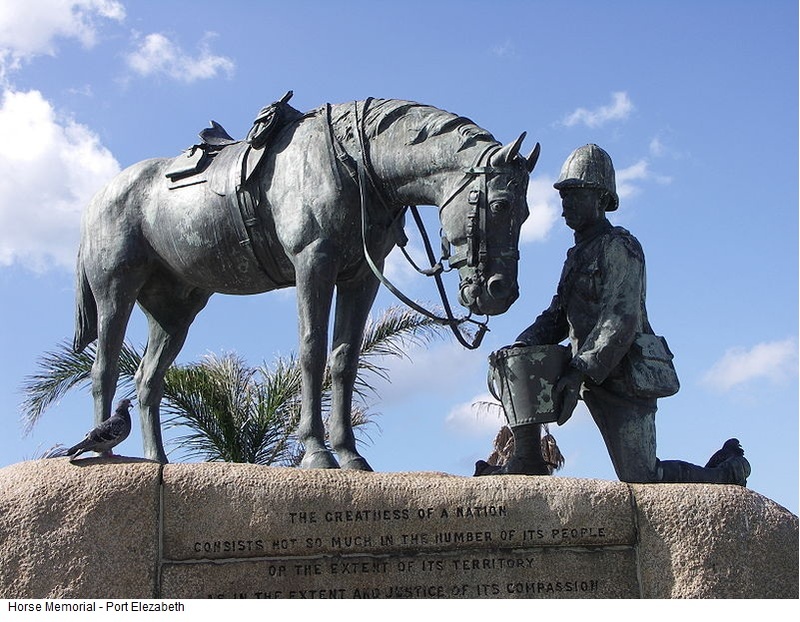 One of the principal reasons for Port Elizabeth taking such an interest in the movement to establish a monument to the horses, which started in 1901, was the fact that most of the horses brought to South Africa were landed at Port Elizabeth. The horses were shipped from all over the world, including 50,000 from the United States and 35,000 from Australia. A ladies committee was formed with Mrs Harriet Meyer as president and £800 was collected for Messrs Whitehead and Sons, of Kennington and Westminster, to erect the statue. The statue was originally located close to the junction of Park Drive and Rink Street, next to St George's Park, but was moved to its present position in Cape Road in the 1950s. "The unveiling of this monument marks the completion of what has been an arduous undertaking on the part of those ladies with whom the idea of raising a monument to the horses originated. To raise a monument to the 'brutes' that perish is considered by many to be misplaced sentiment, while some are inclined to think with Louis Wain 'that all animals have their season of happiness in a hereafter before their final effacement, as a reward for the trials they undergo in life, while under the 'dominion of man'." The horse, and the figure of the soldier are life size. In addition to the memorial proper, there is a drinking trough for horses and cattle, and the wants of the thirsty wayfarer are also provided for. The design as a whole is an object lesson in kindness, and may appeal to the cruel or careless driver, and teach him that there are some who do not think it beneath them to attend to the wants of animals placed under their charge. Assembled by John Howells from anonymous text courtesy the Australian Light Horse Association and Wikipaedia.